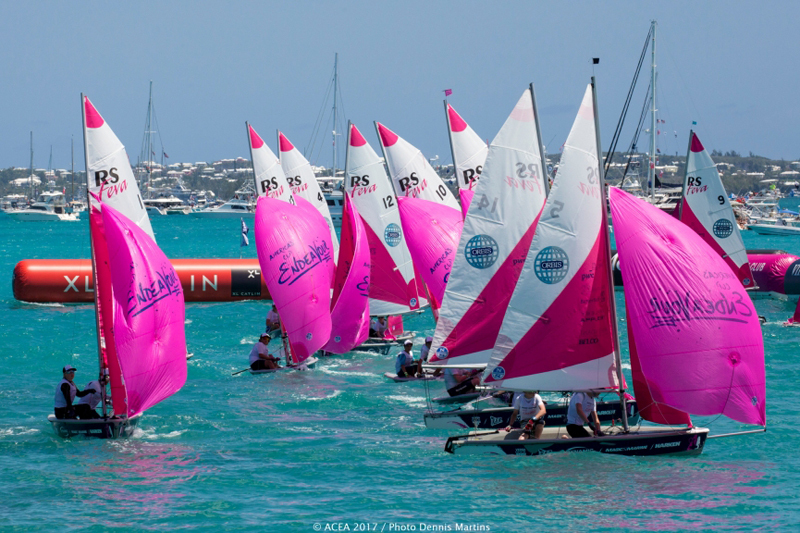 Against the backdrop of the 35th America’s Cup, 32 O’pen BIC sailors, aged 10 to 15, participated in the O’pen BIC class in the America’s Cup Endeavour Junior Regatta. The kids and their parents represented ten different nations from around the world, and hailed the event as the “experience of a lifetime”. The first two days saw spectacular “Un-Regatta” style racing, with required freestyle moves, unique course obstacles, and tight courses. Several reaching, America’s Cup style starts tested the sailors, and made for very close action. Bryce Tone, from Sarasota Florida, edged out Leo Beyer of Germany and local Bermudian O’pen BIC star, Aiden Lopes, to take first place. Olga Fregni of Italy was fourth, followed by Hawaiian, Marcos Baez. The biggest action, however, was on Saturday 17th June between race one and race two of the America’s Cup Match, presented by Louis Vuitton. After the O’pen BIC “Dock Out Show” on the big stage, the kids raced during the “Half Time Show” in front of thousands of cheering spectators. To kick off this quick, eight-minute race, a reaching start brought the O’pen BICs within a few boat lengths of the America’s Cup Village Grandstand. After a short reach and upwind leg, the sailors slalomed downwind around jibe marks. Along the way, required capsizes, stand-up sailing, and tight mark roundings led to exciting racing. The grand finale was the “Bridge of Doom.” In order to cross beneath, sailors had to heel enough to clear their masts, while not capsizing. Marcos Baez from Hawaii Kai Boat Club led the fleet through the finish, but all 32 O’pen BIC sailors brought the spectators to a roar with their impressive show of seamanship. In their encore, O’pen BIC sailors took to the water again in front of the packed Grandstand on Sunday 18th June, just before race three of the America’s Cup Match, presented by Louis Vuitton. This time they put on an O’pen BIC Freestyle Exhibition, and delighted the crowds with all kinds of boat handling skills, creative balancing acts, and spectacular dismounts. The O’pen BIC sailors unlocked new heights in their performance skills by adding elements of windsurfing, skateboarding, snowboarding to junior sailing. 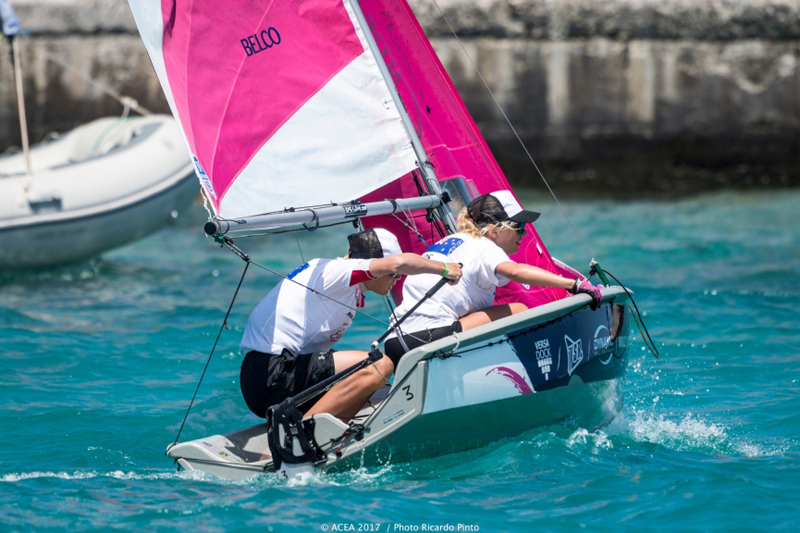 As the incredible America’s Cup Class [ACC] foiling catamarans showcased the future of stadium sailing, the O’pen BIC sailors demonstrated on Saturday and Sunday what is possible in junior sailing.